MISSION, KS--(Marketwired - May 2, 2017) - (Family Features) There are endless exciting firsts in your baby's life, from the first smile and laugh, to the first time he or she sits up or speaks. It can be beautiful and exhilarating, but also uncertain and messy. 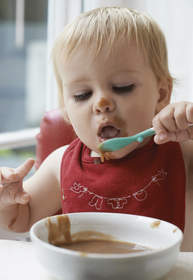 Introducing solid foods is no different -- new and a time for celebration -- but you also know that your walls, floors and clothes may never look the same. These suggestions from pediatric health expert Tanya Altmann, MD, FAAP can help you decide what foods to introduce to your little one, followed by tips from Clorox on how to remove those inevitable stains that are sure to follow. Avocados are high in potassium, fiber and healthy monounsaturated fat, which is good for growing brains and hearts of all ages. Don't worry if your infant doesn't immediately take to avocado; keep offering it as most children eventually come around. Dairy products are healthy for children and packed with a powerful punch of nine essential nutrients: calcium, potassium, phosphorus, protein, vitamin A, vitamin D, vitamin B12, riboflavin and niacin. Vitamin D is crucial for healthy bones and a strong immune system, and is also linked to a decreased risk of disease later in life. Although babies under 1 year of age should not drink regular cow's milk, yogurt and cheese can and should be introduced around 6 months of age. Blueberries, strawberries, raspberries and blackberries are high in fiber and contain vitamin C, antioxidants and other minerals your child's body needs to function normally, stay healthy and protect against disease later in life. If you do not eat vegetables, your children won't eat them either. People who eat more veggies are linked to lower disease rates and a healthier weight. Green vegetables in particular contain almost every vitamin and mineral. Orange veggies are also packed with nutrition, and babies can quickly take to their sweet taste and bright color. The next step is discerning how to remove those inevitable avocado and berry stains that resulted from another first in your baby's life -- a solo food fight. First, scrape away the excess stain and rinse with cool water. Next, apply a stain solution such as Clorox 2 Stain Remover and Color Booster to the stain and rub in. After 10 minutes, wash in hot water using detergent and more stain remover. Some baby food stains are tough to remove; learn more at Clorox.com about how you can keep cherished baby clothes looking new -- perhaps for future hand-me-downs.